Things don’t always go the way I plan. This is especially true when it comes to photography. I was reminded of that this week as I kicked off a long-term project that includes photographing night skies for Uncharted. The idea is to document different astronomical events taking place at various locations around the world, and show how different cultures perceive and interact with the cosmos. It’s a great excuse for taking a break from web programming, project managing, and other forms of tedious office work that have kept me inside more than a person who works at Uncharted should be required to do. It’s going to be some time before I finish, but I’ll be sharing how things are going, including some occasional glimpses of images I collect along my travels. I’ll also share some helpful tips for taking your own photos. This week I decided to explore French Creek State Park near Elverson, Pa. Once an industrial complex for the United States, the park is the largest contiguous block of forest between Washington D.C. and New York City, offering a variety of activities that include hiking, fishing, camping and biking. Even though I grew up only 50 miles away, I had never been there and was hoping it might provide a good backdrop for portions of my project. I was also hoping to capture some glimpses of the Perseids meteor shower which peaked over the weekend. I knew a couple factors would affect how my images turned out. 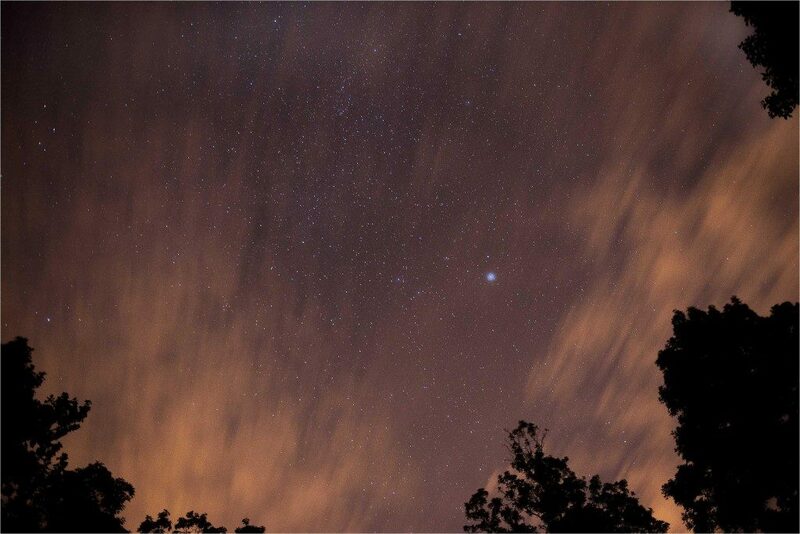 The Philadelphia area is no friend to dark skies, and even though French Creek is more than 50 miles from there, its proximity to smaller cities such as Reading and Pottstown could pose some challenges, especially for capturing glimpses of meteor showers. I confirmed my suspicions with the Dark Sky Finder, a helpful online tool that maps light pollution levels around the world. Areas highlighted in black, blue and green are more ideal for stargazing, while the ambient light emanating from nearby cities limits visibility in yellow, orange, red and white zones. French Creek was in the orange. The weather forecast was ambiguous, promising anything from thunderstorms to clear conditions. This, coupled with a typically humid and hazy climate, threatened to make things even more difficult than usual. I scouted some locations and planned the night. Visibility was good and the weather looked like it was going to cooperate. I set up camp, ate dinner, and prepared my gear for the evening. For this shoot, I used two cameras, a Nikon D800 and a Nikon D700. Both cameras, mounted on tripods, were focused on different scenes to increase the likelihood of capturing more meteors. I set the built-in intervalometer in both cameras to take 20-second exposures every 21 seconds. This is helpful because you can increase your chances of having the shutter open when an unexpected meteor passes, and it frees you up to take other photos, take a nap or grab an evening snack. If your camera doesn’t have one, there are a variety of wired intervalometers compatible with different brands and models. To avoid camera shake, I also used a cable release to trigger the camera. I won’t go into too much more detail about exposures and camera settings except to say that I set my ISO at 1000 and used a 24mm lens at f/2.8. I also used a white balance in the area of 3800 Kelvin. I suggest experimenting with different ISO, white balance and exposure settings until you find what works best. The more mistakes you make, the more you learn, and when we learn from our mistakes we begin taking better photos more consistently. I was planning on shooting from about 11 p.m. until sunrise, but at 2 a.m. clouds slowly smothered my view. They were followed by a storm that lasted until morning. This reminded me of a couple months earlier when clouds covered my view while photographing the supermoon at Valley Forge National Historic Park. I’ve learned on a number of occasions that when things don’t quite work out the way you expect, that there are often opportunities to use the very things keeping you from getting the shot you want (in this case clouds and light pollution) to capture an improvised alternative shot. This philosophy is easily adaptable to just about anything else that I do at Uncharted or in life. Even though the clouds obstructed the meteors I was trying to capture, they provided a unique effect as they moved across the sky over those 20-second exposures. This, combined with light pollution from nearby cities somehow worked to my advantage and gave the scene a more colorful and layered look. Earlier, as I scouted locations for my night shots, I found a nice scene of a fisher at Scotts Run Lake during sunset. While I hadn’t planned on these alternative shots, being open to other options helped me see moments I otherwise might have passed over. If there is anything I haven’t covered here or you have more questions, post a comment below and I’ll do my best to help out. If you’re looking for more hands-on learning, you can sign up for my travel photography course. Alan Murray is the President and a co-founder of Uncharted. He likes scuba diving and snowshoeing. When Alan was five, he wanted to be an astronaut. If you’d like to learn more about Alan or view samples of his photography, check out his personal photo site.